The film version of the 1882 novel by Bankim Chandra Chattopadhyay which incidentally featured the national song for the first time. Though many versions of the song have hence appeared (the most popularly used one being the one set in Desh Raag), this tune by Hemant Kumar effectively captures the environment when the song was written, the strife, the struggle, the patriotic fervour et al. And who better to render the song than Lata Mangeshkar!! Kavi Pradeep has done a lot of patriotic songs in his lifetime but this shall invariably be his best remembered one. Add to that C Ramachandra’s arrangement and Lata Mangeshkar’s magical voice, and what you get is a song that will give you a lump in your throat just about every time you listen to it. If this song doesn’t make you stand up and salute our brave soldiers, nothing else ever will!! Again a tribute to the Indian soldiers set in the background of the Sino-Indian war, this one had another prolific set of artists in Mohammad Rafi, Madan Mohan and Kaifi Azmi. Though not as effective as Aye Mere Watan, Rafi’s singing and the picturization of the song are more than enough to qualify Kar Chale into our top ten. A gem of a tune set to raag Sindhu Bhairavi by Louis Banks(or is it Ashok Patki?) and written by Azgar Khan. This song enters the list not only for the quality of the song but also the nostalgic feeling it brings with it, the good old days of DD! The idea of national integration by bringing in artists and featuring music from all parts of the country was intriguing, as well as endearing. Roja was a landmark movie in Indian music history just by it marking the entry of AR Rahman. All songs in the movie were memorable and Bharat Humko was especially so due to its difference in orchestration. The transition from the soft crooning by Hariharan with sparse instrumental backing to the heavily orchestrated chorus part is one hair-raising experience, even today! The lyrics different from the actual Vande Mataram this song was set to tune by Ilayaraja in his trademark style. This song too employs the orchestral chorus effect to convey the heroism and the environment of struggle. And if you encounter this song as part of watching the movie, the effect is bound to be quite overwhelming. While a lot of hubbub was raised over Maa Tujhe Salaam, not many people at that time noticed this superb version of the national song in the same album. Even today I doubt if all people who have heard of Maa Tujhe Salaam would have listened to Missing. Arranged in a way that only Rahman can, the sax&guitar-laden interludes are just mindblowing! And the female voices (I have only so far managed to identify Anuradha Sriram) do a perfect job of delivering it. My hunch is that the percussion heard in the second interlude doesnt actually come from a percussion instrument, rather some sort of a guitar. I truly consider this soul-stirring song the greatest contribution of Jatin-Lalit to Bollywood! The arrangement is brilliant, and Sonu Nigam and Roop Kumar Rathod spot on in their singing. Following up to Vande Mataram again as a venture with BharatBala, this album featured renditions of the National anthem by over 35 different artists from all over India, both instrumentalists and vocalists. While each of the versions featured in this album are brilliant in their own right, to be fair to everyone I am providing here the video merging the collective instrumental and the collective vocal versions. It not that we haven’t noticed that this is the fourth Rahman song in this ten-song list. Its just that the man has given us so much over these 17-odd years that it is impossible not to find a handful of brilliant compositions in almost every genre! Coming back to this song, a slow classical-oriented melody with minimal instrumentation, the song was sung by the dream duo of Hariharan and Sonu. The video we provide however has Sonu doing a solo. Updating the list with two songs that we discovered much after this post. Two nicely imagined instrumental covers of Jana Gana Mana. First by Warren Mendonsa aka BlackStratBlues, and the second by Baiju Dharmajan of Mother Jane. 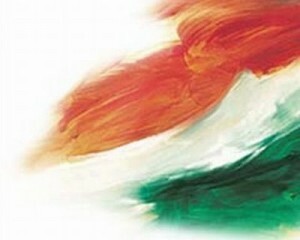 We wish all our readers a very happy Independence Day.